The consequence here is that it is up to you to download and install those updates manually. The third option is to keep the checking for new updates enabled. Firefox will download updates when they become available, but won’t install them automatically anymore. Only Minor Update is a new extension for the Firefox web browser that adds a fourth option. The extension makes a distinction between major and minor updates, and will only install minor ones in the browser. Here is what that means: a minor update is any update that does not increase the main version of Firefox. An update from Firefox 27.0 to Firefox 27.0.1 is a minor update, as is an update from Firefox 24.3.0 ESR to Firefox 24.4.0 ESR. Major updates on the other hand increase the main version of the browser. An update from Firefox 27.0.1 to Firefox 28 is a major update, as is an update from Firefox 24.7.0 ESR to Firefox 31.0 ESR. The extension has been created especially for Extended Support Release users. 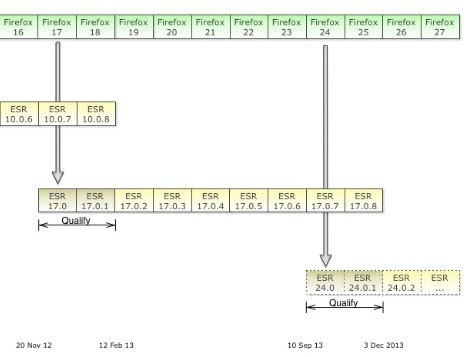 So called ESR releases are special versions of Firefox that have been designed for organizations who don’t want to keep up with Firefox’s rapid release schedule. ESR versions are updated just as Firefox, but new features do not get added to them directly when that happens unless it is a major version switch. When you install Only Minor Update, all minor updates will get installed automatically just like before. Major version updates on the other hand do not get installed automatically anymore. The main idea here is to block updates that modify the browser in major ways without interfering with minor updates that only improve stability or patch security issues. The browser extension can be useful if you want to keep automatic updates enabled for minor updates but disabled for all major version jumps. This entry was posted on Friday, February 28th, 2014 at 11:29 am	and is filed under tech tips. You can follow any responses to this entry through the RSS 2.0 feed. Both comments and pings are currently closed.